GIS is short for Geographic Information System. The Kosciusko County GIS Department manages the County's Geographic Information System. To support all Kosciusko County Departments with their mapping and geographic data needs. To support the public with mapping and geographic data services, and to provide applications that allow the public to view the data that has been created and maintained by Kosciusko County Government. Kosciusko County's GIS is made up of many GIS data layers. These layers include property lines, roads, addresses, creeks and ditches, zoning, and 2 foot contours. Many of these layers have been developed utilizing high-resolution aerial photos (6" pixel) as a base. Kosciusko County has high resolution aerial photos captured every 3 years. Kosciusko County has high resolution aerial photos for the following years 1996, 2002, 2005, 2008, 2011, 2013/2014, 2015 and 2016. These GIS data layers are developed and maintained by the GIS Department and other County Departments utilizing ESRI's ArcGIS software. 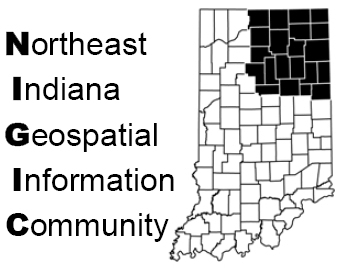 Kosciusko County is a member of the Indiana Geographic Information Council (IGIC), and the Northeast Indiana Geospatial Information Community (NIGIC). Kosciusko County is a GIS data contributor to the IndianaMap.